Your satisfaction is paramount at the Nautilus Inn. 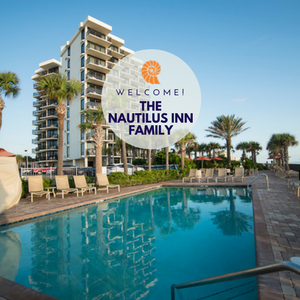 The Nautilus Inn offers Daytona's highest standard in hotel customer service as well as impeccable housekeeping and contemporary services and amenities. The following information will help you in your planning as well as to make your stay more enjoyable! 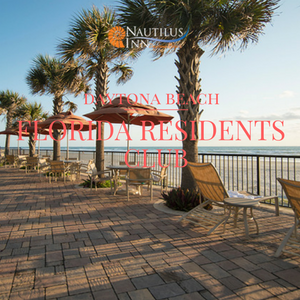 You'll quickly come to understand why the Nautilus Inn is a 2016 Tripadvisor Certificate of Excellence award winner and consistently one of Tripadvisor's top ten hotels in Daytona Beach! 1. Use the calendar to enter your arrival and departure dates: click on the date of arrival, then click on the date of departure for your stay, then click "Check Availability". If you change your dates during the process, you will need to repeat this step to view updated rates. Please note, rates will not be displayed if a change has been made and the Check Availability button has not be clicked. 2. Next, check that the number of adults and children is correct. 3. Click “Rate Options” to see if your stay is eligible for an additional discount and check the applicable boxes. If you have a promo code, this is where it would be entered. 4. Select your room type and the best rate available. Click "Book It!" and complete the process. You're all set! OR, if you desire, call us at (386) 254-8600 and we'll assist you with your reservation. We're available 24 hours a day to help! DEPOSIT: A deposit is required at time of booking and your credit card will be charged one night's stay plus tax. CANCELLATIONS: Cancellations MUST BE MADE BY TELEPHONE. Most reservations may be cancelled without penalty up to three days prior to date of check-in. Please call (386) 254-8600 to cancel a reservation. Cancellations made less than three (3) days prior to arrival will result in forfeiture of deposit. Cancellations for reservations during the Daytona 500 must be made at least thirty (30) days in advance. For the other special events, as listed below, cancellations must be made at least seven (7) days in advance. Special Events: Rolex 24 (January 26, 2019), Daytona 500 (February 14-17, 2019), Bike Week (March 14-16, 2019), Easter Weekend (April 19-20, 2019), Memorial Day/Daytona Country 500 (May 25-27, 2018; May 24-26, 2019), Coke Zero 400 (July 5-7, 2018; July 4-6, 2019), Labor Day (September 1-2, 2018; August 31-September 1, 2019), Biketoberfest (October 18-20, 2018; October 17-19, 2019), and Turkey Rod Run (November 21-24, 2018; November 27-30, 2019). RESERVATION CHANGES: Changes to reservations (arrival or departure dates, duration or number of guests) may result in the loss of a promotional discount or a rate change. Please call (386) 254-8600 to change an existing reservation. Smoking: The Nautilus Inn is pleased to offer a 100% SMOKE FREE FACILITY. There is no smoking or vaping (including e-cigarettes) in the hotel, on the balconies, on the pool deck, or in the parking areas. The minimum charge for smoking in a guest room is $200..
Wireless Internet: You may access wireless Internet anywhere within the hotel. Please ask for a password upon check-in. There is a laptop computer available at the courtesy desk in the lobby. It is available on a first-come basis. Complimentary Cocktails: Offered daily in the Sand Dollar Room from 5:00 - 6:00pm. Must be 21 years of age or older to consume or possess alcoholic beverages. Parking: Free parking is available. Free parking for one vehicle per room is included. Parking for additional vehicles or trailers is limited, and is an additional cost of $10/vehicle per night. Trailers and RV's are counted as additional vehicles. ﻿Parking for over-sized vehicles and parking during special events may be priced differently. Guest Laundry: Washers and dryers, iron and ironing board are located for your convenience on the 4th floor. Hours of availability: 8:00am to 10:00pm. Housekeeping Policy: While respecting the need for privacy, to ensure the well-being of our guests, the hotel reserves the right to visually inspect all guest rooms daily. The minimum level of service includes exchanging towels and emptying trash. Staff will knock and announce themselves before entering.